Classic studies suggest that the most profound and worrying kinds of power are the hardest to observe. We often witness highly visible political battles and can use pluralist methods to identify who has material resources, how they use them, and who wins. However, key forms of power ensure that many such battles do not take place. Actors often use their resources to reinforce social attitudes and policymakers’ beliefs, to establish which issues are policy problems worthy of attention and which populations deserve government support or punishment. Key battles may not arise because not enough people think they are worthy of debate. Attention and support for debate may rise, only to be crowded out of a political agenda in which policymakers can only debate a small number of issues. Studies of power relate these processes to the manipulation of ideas or shared beliefs under conditions of bounded rationality (see for example the NPF). Manipulation might describe some people getting other people to do things they would not otherwise do. They exploit the beliefs of people who do not know enough about the world, or themselves, to know how to identify and pursue their best interests. Or, they encourage social norms – in which we describe some behaviour as acceptable and some as deviant – which are enforced by the state (for example, via criminal justice and mental health policy), but also social groups and individuals who govern their own behaviour with reference to what they feel is expected of them (and the consequences of not living up to expectations). Such beliefs, norms, and rules are profoundly important because they often remain unspoken and taken for granted. Indeed, some studies equate them with the social structures that appear to close off some action. If so, we may not need to identify manipulation to find unequal power relationships: strong and enduring social practices help some people win at the expense of others, by luck or design. Example 1. The control of elected office is highly skewed towards men. Male incumbency, combined with social norms about who should engage in politics and public life, signal to women that their efforts may be relatively unrewarded and routinely punished – for example, in electoral campaigns in which women face verbal and physical misogyny – and the oversupply of men in powerful positions tends to limit debates on feminist issues. Example 2. ‘Epistemic violence’ describes the act of dismissing an individual, social group, or population by undermining the value of their knowledge or claim to knowledge. Specific discussions include: (a) the colonial West’s subjugation of colonized populations, diminishing the voice of the subaltern; (b) privileging scientific knowledge and dismissing knowledge claims via personal or shared experience; and (c) erasing the voices of women of colour from the history of women’s activism and intellectual history. 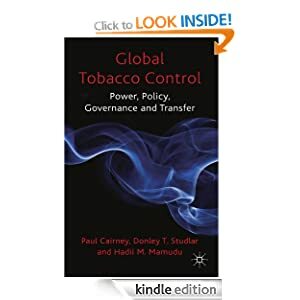 It is in this context that we can understand ‘critical’ research designed to ‘produce social change that will empower, enlighten, and emancipate’ (p51). Powerlessness can relate to the visible lack of economic material resources and factors such as the lack of opportunity to mobilise and be heard. 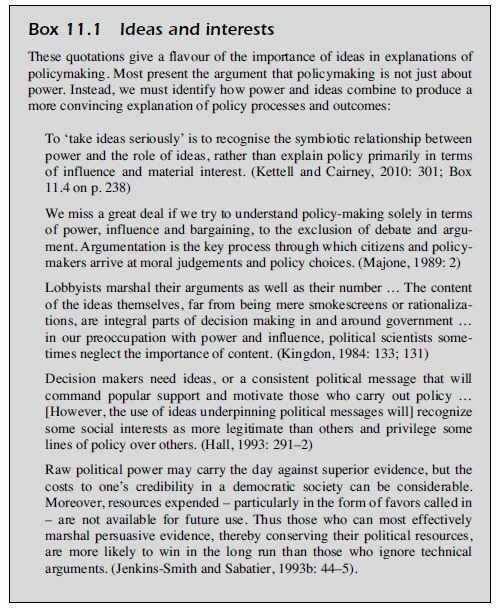 Policy theory is about the relationship between power and ideas. These terms are difficult to disentangle, even analytically, because people often exercise power by influencing the beliefs of others. 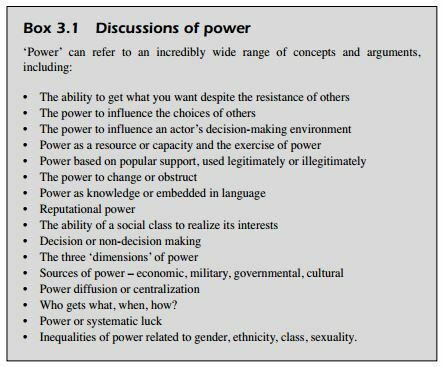 A good rule of thumb, from classic studies, is that the more profound and worrying kinds of power are the hardest to observe. Dahl argued that elitism was unobservable; that it was ‘virtually impossible to disprove’ the idea that inequalities in society translate into systematic advantages across the political system. Dahl’s classic statement is that, ‘A has power over B to the extent that he can [or does] get B to do something that B would not otherwise do’. To demonstrate this power requires the identification of A’s: resources, means to exploit those resources, willingness to engage in political action; the amount of power exerted (or threatened) by A and the effect of A’s action on B. Dahl identified ‘key political choices’ involving a significant conflict of preferences – suggesting that the powerful are those that benefit from ‘concrete outcomes’. He identified inequalities in many areas but no overall, coordinated, control of the policy process. His work is often described as ‘pluralist’. Subsequent debates were based on a critique of pluralist methods. Bachrach and Baratz argued that the ‘second face’ of power is exercised before Dahl’s ‘key political choices’. Power is not simply about visible conflicts. It can relate to two barriers to engagement. First, groups may exercise power to reinforce social attitudes. If the weight of public opinion is against government action, maybe governments will not intervene. 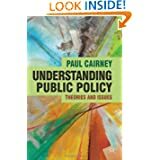 In such cases, power and powerlessness relates to the inability of groups to persuade the public, media and/ or government that there is a reason to make policy; a problem to be solved. Second, policymakers can only pay attention to a tiny amount of issues for which they are responsible. So, groups may exercise power to keep some issues on their agenda at the expense of others. 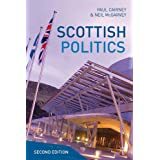 Issues on the agenda may be ‘safe’ – more attention to them means less attention to the imbalances of power within society. Schattschneider argues (in A Realist’s View of Democracy) that the structures of government, such as legislative procedures controlling debate, reinforce this problem when determining which conflicts receive attention and which are ignored. The ‘third dimension’ of power suggests that people or organizations can be powerful without appearing to act. For example, Crenson’s study of US air pollution found that regulations were relatively low in a town (Gary, Indiana) dependent on US steel. Using pluralist methods, we would witness inactivity, or overt agreement on minimal regulations. This would disguise a power relationship in which one group (US Steel) benefited at another’s (Gary’s ill population) expense. US Steel was powerful without having to act, and the town’s public was powerless because it felt unable to act. Lukes takes the idea of a false consensus further, drawing on Marxist descriptions of the exploitation of the working classes within a capitalist system: if only they knew the full facts – that capitalism worked against their real interests – they would rise up and overthrow it. In this scenario, they do not object because they are manipulated into thinking that capitalism is their best chance of increasing their standard of living. We observe a consensus between capitalists and workers, but one benefits at the expense of the other. Foucault describes a further dimension of power, drawing on the idea of society modelled on a prison. The power of the state to monitor and punish may reach the point in which its subjects assume that they are always visible. This ‘perfection of power’ – associated with the all-seeing ‘Panopticon’ – renders the visible exercise of power unnecessary. Individuals accept that discipline is a fact of life, anticipate the consequences of their actions and regulate their own behaviour. Control may be so embedded in our psyches, knowledge and language, that it is ‘normalized’ and invisible. We ‘know’ which forms of behaviour are deviant and should be regulated or punished. Therefore, power is exercised not merely by the state, but also individuals who control their behaviour and that of others. These arguments rely as much on the role of ideas as power. Discussions of agenda setting focus on the ability of groups to ‘frame’ issues as inoocuous or specialist, to limit the number of participants in the policy process. Bachrach and Baratz’s first barrier to engagement is the dominant set of beliefs held within society. Luke’s third dimension of power focuses on what people believe to be their real interests and the extent to which those perceptions can be manipulated. He describes Gramscian ‘hegemony’ in which the most powerful dominate state institutions and the intellectual and moral world in which we decide which actions are most worthy of attention and which are right or wrong. Foucault’s social control is based on common beliefs/ knowledge of normality and deviance. To limit policy change by excluding participants who hold beliefs that challenge current arrangements. By excluded groups to challenge barriers to policymaking engagement. While some studies might suggest that elite or state dominance may never be challenged, others treat established ideas as barriers to engagement which can be overcome (as in the studies by Bachrach & Baratz and Crenson). We used to talk more about structural power carried out by individuals, with no autonomy or choice, on behalf of certain classes. Now, we talk about a combination of individual action and the rules they follow (see forthcoming post on institutions). Luck. Power may be measured according to outcomes – the powerful benefit from decisions, and the powerless lose out. If so, people may be ‘lucky’ as well as powerful. They may benefit from outcomes secured by the actions of others (see forthcoming post on rational choice).